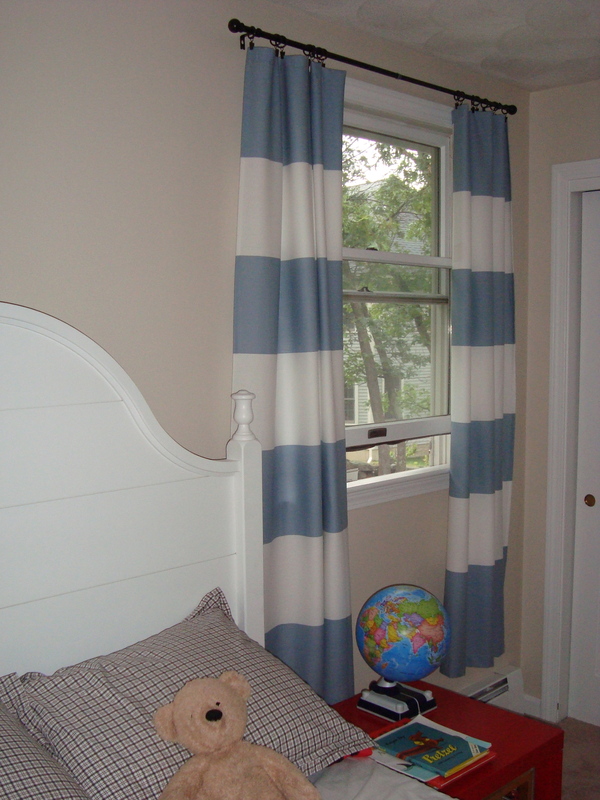 …but I like it even better as easy-peasy drapes for my in-progress kid’s room. $120 to add three graphically-awesome, light-killing window treatments to my early riser’s room? Yes, please. Want to do the same? Go here for directions (only this time I used fabric glue instead of fusible webbing…an even lazier, er, I mean, easier approach). I love this solution. I did this in my sunroom. The curtains end up being a smidge short, but with those floorboard heaters (which I think I spy in the picture) you have to watch that anyway. Yes, yes…you definitely spy floorboard heaters! I thought I would add some cool contrasting fabric to the bottom hem, but once I hung them I liked the length. Fabric+heaters=Trouble in a kids room.